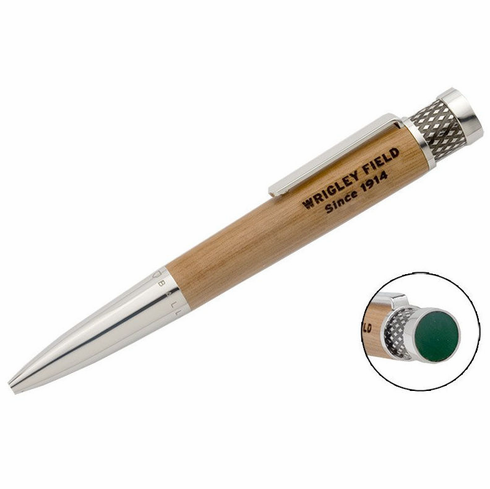 Wrigley Field Color Top Baseball Stadium Ballpark Pen. Finally...a chance to hold a piece of Cubs history every day of the year with one of these Wrigley Field ballpark collector ballpoint pens. Made from actual salvaged stadium seats which were removed from the stadium either during remodeling efforts or demolition. This design is perfect for collectors, executives, and baseball fans. Each one-of-a-kind retractable pen is laser engraved with the stadium name and the years in existence. Hand-signed certificate of authenticity is included. Note: Due to the age of the wood and uniqueness of the seats, the painted surfaces may be multicolored due to layers of paint and the pens may have dark irregularities.